Coming across the Lakebed Temple in Twilight Princess for the first time caused many gamers to emit a resigned 'here we go again' sigh, because it's clearly a successor to the infamous Water Temple in Ocarina of Time - the most confusing dungeon in the Zelda canon. 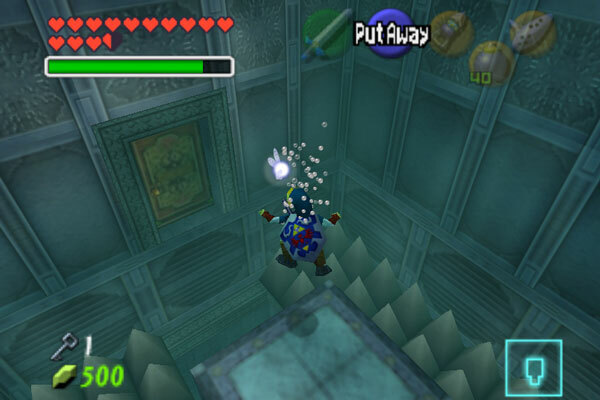 Submerged beneath Lake Hylia, the Water Temple is made up of five floors which you move between by regulating the water levels. There isn't much finesse to the level design here, which feels like a whole load of rooms messily plastered over each other. In the original N64 version, the constant need to go into your equipment screen to put on the iron boots made it a particular drag, though this was fixed and made more accessible in later remakes. As if water levels weren't bad enough in games already, this one managed to be confusing as well as cumbersome to play. If it didn't happen to exist in one of the best games of all time, most of us would probably have given up at this point.